A new French movie trailer for Marvel's Thor has been released and it pretty much plays out like the last trailer we've seen. It was cut a little different, and includes a few new additional scenes, but the biggest difference is that it's in French, and it's kind of funny seeing American movies dubbed like this. At least the voice over actors do a good job! 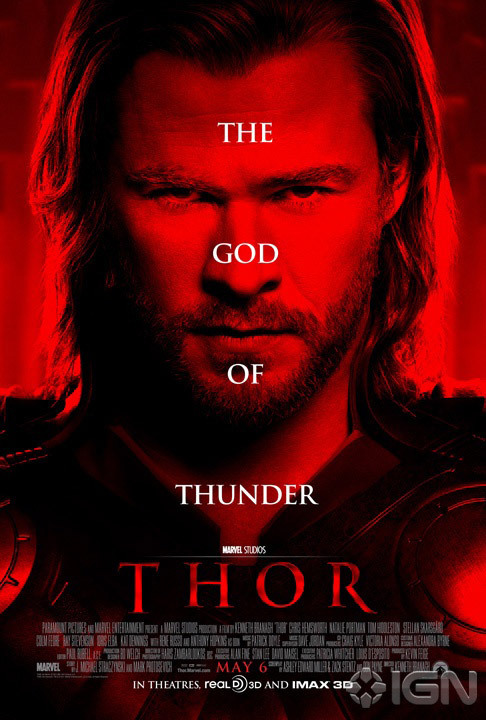 Thor stars Chris Hemsworth, Natalie Portman, Tom Hiddleston, Rene Russo, Idris Elba, Kat Dennings, Clark Gregg, Jaimie Alexander, Ray Stevenson, Joshua Dallas, Tadanobu Asano, and Anthony Hopkins. Thor opens in 3D on May 6th 2011. Marvel Releases first THOR Movie Poster!